Qatar Gymnastics Federation (QGF) President Ali Ahmed al-Hitmi poses with Aspire Academy HR Manager Khaled al-Hamer, BK Sport’s Sayed, Bounce’s Peter Pojovich, Dana Water’s Zaid Jose, Radio Olive and Suno’s director Krishna Kumar after signing a sponsorship contract for the 12th Artistic Gymnastics World Cup. 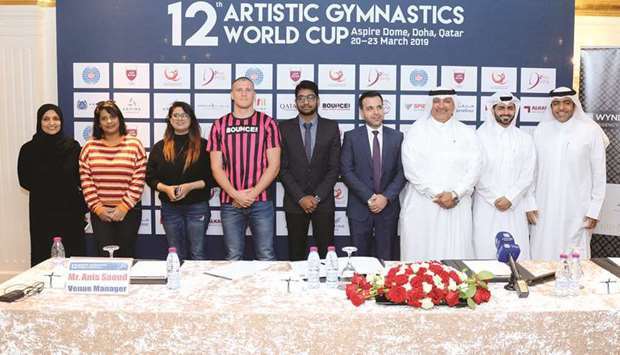 The Organising Committee of 12th Artistic Gymnastics World Cup led by Ali al-Hitmi, President of Qatar Gymnastics Federation (QGF) on Saturday signed a partnership agreement with Aspire, and other partners, for the forthcoming championships to be held at Aspire Dome from March 20 to 23. Aspire Dome, the world’s largest indoor multi-purpose dome, had also played host to the 48th Artistic Gymnastics World Championships in October last year. It was also the first time that an Arab nation had staged the Worlds. The World Cup too serves as a qualification event for Tokyo 2020 Olympics. 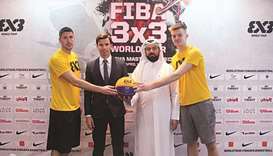 The organisers also signed agreements with hospitality partner Wyndham Grand Regency Doha, BK Sport, Bounce, Al Dana Water and Radio Olive & Suno. Meanwhile, Indian gymnast Dipa Karmakar has pulled out of the Doha World Cup. The withdrawal is a big blow to her Olympic qualification plans as the Doha event is part of an eight-event qualifying system for the 2020 Tokyo Olympics, under which the gymnasts will make the cut based on their top three scores. The 25-year-old, who became the first Indian gymnast to qualify for the final at the 2016 Rio Olympic Games, aggravated her knee injury during the vault final at the Baku Artistic Gymnastics World Cup last week. She had finished last after deciding not to take her second attempt. Dipa, who finished fourth in Rio Olympics, had performed a higher-difficulty ‘Handfront 540’ vault, scoring 14.466 and 14.133 points in the two qualifying round for an average of 14.299 to qualify for the vault final in the third position. But she was left crestfallen after aggravating a knee injury while landing during the first attempt in the final. “Dipa had some problems in her knee before the final. She was feeling some pain yesterday, but felt better after working with physio. 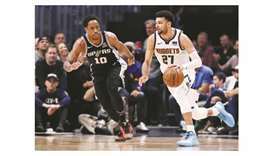 She attempted the vault finals but fell on her first vault, aggravating the injury due to undesired landing,” Gymnastic Federation of India (GFI) official Riyaz Bhati told PTI. The Asian Championships will be held in Mongolia (June 13-16) while the FIG World Championships is in in Stuttgart (GER) from October 4-13. Dipa had claimed a bronze in vault at the FIG World Cup in Cottbus in Germany in November last year to fuel her Olympic dream.